The day we’ve all been gearing up for is nearly here…it’s only two short days until Record Store Day! Are you as excited as we are? We’re looking forward to seeing our fantastic regular customers as well as welcoming you if you’re planning your first visit. The sun should be shining down on Perth making it a great day! First up, the first 33 customers in the shop will get a FREE Backbeat tote with lots of great freebies inside. It’s like a Record Store Day loot bag! Ten lucky people will have the exclusive Polaris Collaboration Session 7” featuring Jennifer Castle & The Weather Station in their tote! If you miss out on the Polaris 7” don’t worry, you’ll still get some Backbeat swag, a flexi disc from Pirates Press and more! We’ve also got some amazing prizes to give away! 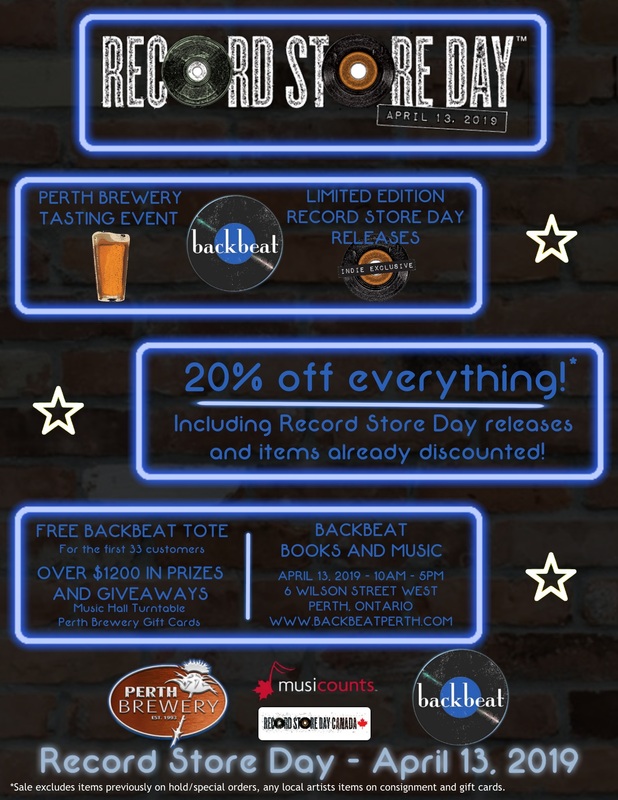 You could win a Music Hall USB-1 Turntable or one of eight $25 Perth Brewery gift cards! Woohoo! Perth Brewery will be here pouring a selection of their fine beers for our customers. Perth Brewery was here last year and will once again be setting up in our shop this year to offer you a tasting of their amazing traditionally crafted beers. From thirst quenching lagers, pilsners & ambers to delicious IPAs, stouts and fun seasonals, Perth Brewery makes some fantastic beers right here in Perth. Saturday is also sale day here – it’s one day only, so you won’t want to miss it. 20% off everything in stock (includes Record Store Day exclusives and items previously discounted). Sale excludes items previously on hold/special orders, any local artists items on consignment and gift cards. This year Record Store Day Canada has once again teamed up with MusiCounts to raise funds to help put instruments in the hands of children who need them most. You’ll be able to purchase the exclusive Superhero Suite EP from Kevin Hearn and Friends for $15 right here at Backbeat on Record Store Day and all the proceeds will go to help support this great program. We’ll be open from 10:00 a.m. till 5:00 p.m. Looking forward to seeing you here! April 9, 2015 Record Store Day and our 2nd “Re-Birthday” weekend sale. April 18-19-20, 2015.